1. What is an Enzymatic Cleaner? 2. Why are Enzymatic Cleaners Useful? Enzymatic cleaners have been used for years by both commercial companies and in the home. They’re especially useful for cleaning carpets and fabrics that have pet stains and smells. The enzymatic compounds work to break down the core components of these stains and remove them completely rather than just masking them. This is what sets enzymatic cleaners apart from traditional carpet cleaning products, and it is what makes them so popular. An enzymes is a biological compound that works to help speed up chemical reactions. There are thousands of different enzymes and they help with everything from cellular processes in your body to speeding up the decomposition process of household waste. When you combine these enzymes with natural household cleaners, you get a very powerful and natural cleaning agent that does more than just mask odours and stains. 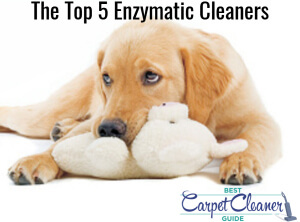 Enzymatic carpet cleaners contain a specific set of enzymes. These enzymes specifically break down biological substances: Things like starches, fats, proteins, and oils are the prime targets of these cleaning-specific enzymes. So, instead of just wiping away the various surface foods and contaminates, the enzymes will continue to break them down. They’ll turn these potentially harmful food particles into things like carbon, oxygen, and hydrogen. These things are safe to ingest and to have around. Also, enzymatic cleaners typically don’t contain the normal harsh chemicals that you can find it traditional household cleaners. This makes them safe for you to use, and they’re safe for your kids and pets to be around as well. You can use your enzymatic-based cleaners with a variety of common household cleaning chores. Because they’re safe and biodegradable, you don’t have to worry about them contaminating any surfaces or making your pets or kids sick from breathing them in or coming into contact with them. Normally, you’d clean these areas of your home with bleach or other strong chemicals. However, an enzymatic cleaner can replace all of these. They’ll naturally break down the proteins that stain your tubs, toilets, and countertops along with any odours. These types of cleaners make it very easy to remove fatty or oily stains out of clothing or fabrics. You should pre-soak your clothing overnight in your enzymatic cleaning solution, so it has time to break down the stains before you wash it. The enzymes in your enzymatic cleaners are perfectly suited for cleaning carpets, hard floors, and fabrics with organic pet stains. They break down the proteins that are present in the stains. This helps to get rid of the stain as well as the source of the pet odours. You also have to remember that enzymatic cleaners are biological molecules. This means that they take longer to work than traditional chemical cleaners. It can take several hours or even several days for them to break down a stain completely, and they get damaged very easily. Ideally, use them with warm or lukewarm water and don’t mix them in with other soaps or cleaners for the best results. Cat urine is very potent, and it is made up of uric acid, sodium, creatinine, pheromones, urea, electrolytes, bacteria, and urobilin/urobilinogen. The ammonia smell that is so potent with cat urine results from the bacteria breaking down the uric acid. The smell gets worse as the bacteria continue to break down the components in the cat’s urine, and it can smell for up to six years. This is very important to know because your normal chemical cleaners don’t and can’t break down the uric acid in the cat urine. However, the biological components in the enzymatic cleaner can and will break it down at the core and get rid of it. It breaks it down into ammonia and carbon, and these two things evaporate. However, for the cleaner to do this, it has to dry naturally. If you don’t allow it to dry, it’ll stunt the breakdown process and leave residue behind. You also want to be sure that you cover every part of the stain. If it’s on your carpet, spray slightly around it. If it’s on cushions, soak the area completely. Finally, you may want to apply two or three applications over the course of two weeks to be sure you get everything. Dog urine also contains uric acid, and as we stated with cat urine, traditional cleaners can’t break this component down. Enzymatic cleaners break up these uric acid crystals and kill any bacteria that surrounds them. In order for the enzymatic cleaner to work effectively, you have to saturate the stain and the surrounding area and let it air dry. If the urine spot is old and dried, you have to make sure that the cleaner and the area stays wet until it has time to break down and dissolve the uric acid crystals. It may take more than one application to rid the are of the stain and odour completely, but it will eventually remove it. Note that you can’t normally use an enzymatic fluid in heated carpet washer machines – the heat will stop the chemical processes from occurring. Founded in 2008, Bio-Fresh Environmental is a UK-based company that specialises in deodorizing and removing human and animal urine stains – their most famous product is Urine Off. They have several cleaning products available for both old and new urine stains, and they’ve become one of the leading companies in Europe because of their focus on this niche cleaning product. Urine Off is designed to tackle urine stains and odours that result in set-in stains. This can happen if you don’t thoroughly clean the area straight away and it soaks into the carpet or into the fabric. Urine Off is currently used in several private and public settings including health centres, care homes, kennels, veterinarian offices, catteries, and in the home. Unlike many ordinary cleaners that are designed to disinfect and wash away the watery components found in urine, Urine Off has a specially designed formula with enzymes that attack and destroy the urine crystals. It destroys these hard to get rid of urine crystals, and in turn, this lifts the urine stains and the odour and prevents it from coming back. The microorganisms that are left by traditional cleaners are also destroyed in this process, and it helps to prevent the spread of common diseases. This product is specially formulated to handle cat and kitten urine stains and odours. It is safe to use on several different types of carpeting as well as hardwood and laminate flooring, fabrics, clothing, and many drapery materials. It is certified as being safe to use around pets and people, and it has the USDA certified biobased product seal for a healthier and safer formula. This spray also contains pheromone blockers, and these pheromone blockers discourage your cat or kitten from urinating in the same spots once you’ve applied the spray and cleaned them. It also helps to discourage your cat from marking. You get 500 ml in each bottle, so you have enough to clean again and again, and the spray nozzle makes it very easy to direct the formula right onto the stains without getting it everywhere. The formula contains a pheromone blocker. It’s safe to use on a variety of fabrics and flooring. It may take more than one application to work properly. It may not deter stubborn cats or kittens for long. Removes both old and fresh urine stains and odours permanently, from virtually any surface. Tackles even the strongest tom cat odours. Contains pheromone blockers to help discourage marking. This dog and puppy urine stain and odour remover works on both new and old stains. You can also use it safely and effectively on new and old vomit and faeces stains. It is a safe formula that doesn’t contain any bleach or toxic agents, so it’s safe to use around your pets and children. You get 946 ml in every bottle so you can use it over and over. The cleaner’s formula contains high-performance bio-enzymatic technology that can help break down urine crystals and destroy the microorganisms that can spread disease. It has the USDA certified biobased product seal, and it comes with an easy-to-use carpet injector cap. This cap allows you to squirt the cleaner directly on the stained areas without spilling it all over. You can use it on carpets, hardwood and laminate flooring, fabrics, and upholstery. It has a carpet injector cap for easy application. You can use it on several fabrics and carpet. It might not remove the stains completely. Nature’s Miracle was founded over 30 years ago, and it was originally producing cleaning products that were designed to be used in preschools as a safe and effective cleaner. This company used a safe and effective enzymatic formula that quickly caught the attention of pet parents everywhere, and it became a very well-known brand with a distinctive bright red bottle or bright red cap. When it first came out, it was one of the only enzymatic formulas available to the general public. Their cleaning solution formula is pet and family-safe, and this made it a popular brand in schools and households with younger children as well. 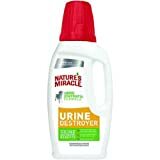 Since it was founded, Nature’s Miracle has expanded their product lines by offering stain and odour removal sprays and products for pet and humans. It’s used everywhere from homes to health centres to veterinarian clinics and more. You can also purchase litter, waste management aids, and potty training aids for your kitten or puppies to reduce the number of accidents they have. Nature’s Miracle has products available worldwide, and you can purchase them online, at pet specialty stores, or at several large retailers. You can choose from three different container sizes with this cleaner including a 0.25 gallon (0.9 litres), a 0.5 gallon (1.9 litres), and one gallon (3.8 litres). It contains a bio-enzymatic formula that eliminates strong pet urine odours, any sticky residue, and yellow stains. It works to lift the urine stains from the carpets, flooring, or fabric and destroy any urine crystals that may be left behind so no diseases can spread. It comes with a guarantee to permanently lift and remove urine stains and odours. You can use it as a remover or as a pre-treatment for fabrics by applying it to any stained areas and rubbing it in before tossing it into the wash. It does take slightly more formula to work on repeat stains, and it is safe for both white and colour fabrics. It removes stains, odours, and sticky residue. You might have to treat set-in stains a few times. You don’t get much of a scent. Simple Solution has been one of the premier pet odour, stains, and house training products companies for over 30 years. These products were specially designed for busy people who don’t have a lot of time to clean up after their pets and need fast solutions to the pet odours and stains that come with accidents. Simple Solutions was also one of the first companies to mass produce and sell enzymatic cleaning products for industrial, commercial, and domestic use. They also have oxi power formulated in with their enzymatic formulas for a more powerful and deeper clean. This company manufactures and sells a variety of products worldwide, and they’ve been selling in the UK since 1988. They offer several different lines of pet care products with several prices including bags on board pet cleanup bags, OUT! cost-effective cleaners, Simple Solution stain and odour remover, Vet’s Best internal and external care, and Buffalo Range treats. They’re all designed to be fast acting, healthy, safe, and lasting. They also offer dog and cat cleaning solution lines that help to remove any animal-specific odours or stains quickly and efficiently. 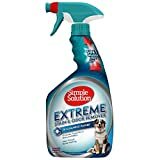 You can choose from either a 500 ml or a 945 ml container in Extreme Dog or Extreme Cat formulas. The formula is three times stronger, and it contains enzymes along with Pro-Bacteria that works to lift and remove old cat and dog stains quicker. This professional-strength formula is safe to use on any water-safe surface including carpets, bedding, clothing, and upholstery without damage or fading. The formula is pet and child-friendly, and you can use it with them around without any issues. The trigger spray design is easy to use, and it directs the formula exactly where you want it to go without spraying it everywhere. This is also an environmentally-friendly and natural product that acts as a deodoriser as well as a stain remover. You should leave it to soak into the stained area for at least ten minutes before you blot it dry. The formula has oxy power mixed with Pro-Bacteria. It’s safe for use on multiple fabrics and surfaces. The formula may cause skin irritation. It may leave a dull spot on your carpets. Amazing Concepts LLC was founded in 1995 by Larry Kaiser and his two business partners. Nok-Out was one of the first formulas they put together, and it continues to wow customers to this day. The company focused exclusively on pet stains and odour fighting formulas and a variety of cleaners over the years, and it also expanded to sell products in the United States as well as across Europe. In 2003, the Nok-Out formula was presented to the EPA who tested the formula and gave it the title of a Broad Spectrum Disinfectant. In 2002, the company changed again. Global Environmental Restoration, Inc purchased the Nok-Out brand and began to transition it out for commercial uses. The company’s chemists improved on the original formula, and they added a hospital-grade disinfectant to make it better suited to larger commercial operations to remove mould, bacteria, and various viruses. It was widely used during the Hurricane Katrina cleanup, and they’re designed to remove stains and odours while leaving the surface layers unharmed. Finally, Nok-Out is an environmentally-friendly product that is safe for both children and pets. This odour eliminator and sanitiser come in a very large one gallon (3.8 litre) container that gives you enough formula to clean and sanitise large areas or use it several times on a variety of flooring. It goes to the bottom layers of the stains and works to break down the urine crystals to reduce and eliminate odours and set-in stains. It’s safe for a variety of fabrics and clothing. You can pour this formula straight on the stained area, or you can dilute it down with water and use it on your furniture. It’ll work to strip out any lingering smells and oxidise any remaining marks or stains. You can also use it to deter your animals from repeat offending or marking up the same areas. You should test a small area before you clean the entire carpet or fabric as it may pull the colour out. It comes in a large container. You can use it on several fabrics and carpets. It may pull the colour out of certain carpet materials. You may have to dilute it. MisterMax has been producing several cleaning product lines since 1984. The company’s main objective is to supply a high-quality cleaning product for a variety of textiles. Originally, the cleaning products were meant to be used on-location for stains or odours on upholstery, furniture, carpeting, draperies, and other fabrics. For several years, they concentrated on giving their customers high-quality products and services that ranked in the top tenth percentile of the fabric care industry. They’ve since expanded their product line to include repairs, dyeing, flood restoration, sales, installations, and odour control products. One of the main products that they’re widely recognized for is the Anti-Icky Poo line of pet odour and control formulas. It has been specifically designed to remove urine and organic waste stains and odours. It covers urine, vomit, faeces, char, smoke, dead body odours, and other organic matter. It works on dozens of flooring types, fabrics, textiles, urinals, drains, and septic tanks. It’s different because it actually works to get to the source of the odour and destroy it from the ground up instead of masking it. You can purchase this product line throughout Canada, Europe, and the United States online or through several large retailers. This odour-removing formula comes in a large quarter gallon size (one quart), and it comes with an easy-to-use spray top that ensures that you’ll get the formula directly on the stains each time you use it. If the stain is extremely bad, you might want to peel the carpet back and treat the undercarriage as well as the top to ensure you remove the stain entirely. It has a very light and clean scent. You may also need to treat a heavily stained area more than once for it to treat the area effectively. In addition to treating the area and removing the scent and stains, it can deter your can or dog from revisiting and staining the area again. This formula works well on several different types of carpeting, wood or laminate flooring, drapery, upholstery, and many different fabrics. The formula is multi-use and versatile. It has a very light and fresh scent. You may have to treat an area multiple times. This product is one of the more expensive lines.